This route could accommodate a ground level Light Rail Transit system at a lower cost and a more rapid construction program than a Broadway Subway.This bike tour is 7 kilometres long, and will cover the eastern half of the route.Along the way, we will stop at important places and discuss the pros and cons of this alternative concept. While I am out of town you could join this event. Let me know in the comments section below if you go, and if you did because you read about it here. I doubt I am actually that influential. But I was invited and I can’t go. But maybe you could and would like to hear about what might be a Good Idea. The Walk Leader is Adam Fitch and he asked me to post this. Equally if you think he has rocks in his head also please post below. I suspect the route would be cheaper to build but with central Broadway being 2/3s of projected ridership it seems pretty obvious to me that a route that does not serve central Broadway will have a higher cost per rider or new rider than even a fully tunnelled Skytrain with way less benifits. Build it right, build it where the demand is. If you have a hankering to go north while in Italy, I could offer a tour of Stuttgart. I agree with Rico – the subway must be built on Broadway because that’s where the demand is. The corridor generates huge ridership from offices and businesses in the area, as well as students passing through to UBC. W 2nd Ave is a nice bike ride and connects to some amenities in False Creek, but it doesn’t have anywhere near the ridership potential – just look at the existing 84 route compared to the 99 route. I should have been clearer, while my personal preference is for a continuation of the M-line RRT technology it is all about the route. LRT as proposed by Translink down Broadway would also greatly outperform the proposed 2nd/16th route. It should not be about total capital cost, it should be about the cost per rider. Otherwise you could start a tram between Langley and Abbotsford for pretty cheap….it may only serve a couple of thousand people a day but it would probably be less than $100 million…a rapid transit corridor on Broadway will be expensive, but it will serve a lot more people than 2nd or 16th….and at the end of the day it will have a capital cost per new rider way less than the 2nd/16th option. Hopefully this option dies quickly before it detracts too much from viable choices. As we all know, Premier Clark lost her seat at Vancouver-Point Grey. The other day on CKNW the BC politics experts panel basically said that Kelowna will see a second bridge (! ), before Vancouver sees anything done along Broadway, underground or above, unfortunately. To Alex – it was never “her” seat. And whoever it was on CKNW was probably betting that the Translink funding referendum will probably go the same way as the one recently in King County, WA. That was the result of a much higher turnout in low transit areas. Organizers of the yes side here will also take note of that, and be working hard to do better in higher transit service areas. Comme on you guys! a LRT is not good enough for Vancouver. Ottawa is building one, with a tunnel in the downtown area. Amsterdam, Berlin, Dusseldorf, Frankfurt have several lines, so is Paris ( First opened in 2006, the T3 tram line has since 15 December 2012 run between Porte d’Ivry and Porte de la Chapelle. This extension benefits some 170,000 inhabitants and 100,000 jobs, with over 302,000 passengers expected to use the whole line each day. Red Frog, while I prefer the RRT option and think that Translink analysis shows it is the best option (I am OK with combo 1 too) the issue in my mind is the Adam finch proposal misses most (actually pretty much all except UBC ) of the traffic generators, so it becomes a UBC line. If you look at the demand modelling only 1/3 of the boardings are from west of Arbutus so being extremely generous Adams proposal would have half as many riders as a Broadway option (probably 1/3 maybe only a quarter). I think his route will be cheaper to build…..but obviously it will be no where near half the cost……so it really does not take a lot of thought to see the cost benifit of the Adam Finch proposal is way way way way less than ANY of the Translink options studied (which would have greater external benefits). If we were just looking at the cheapest route lets just run a line from Oak to UBC on Marine drive (not serious here obviously that line would not serve many people). A line that costs 1/2 is a worse investment than a line that costs double but has 3 times the ridership. The Adam Finch proposal will be worse than that. Ottawa’s Confederation Line is very expensive. It is being built as a light metro/light rail hybrid, with the full grade separation required of light metro and the long stations required of light rail. Light metro with shorter stations would be cheaper for the proposed initial line, but it wouldn’t have the at-grade capability desired for the branches they hope to build later. The metropolitan regions that contain Amsterdam, Dusseldorf, and Frankfurt have regional metros to connect between the various cities in the region. They use trams like we use local buses to provide coverage within cities, and they use regional metro like we use SkyTrain to connect regional centres. Mike and Rico, I was being facetious.. I recently started using the 84 buses when I go from either Kits or Broadway-Granville or Broadway-Cambie to VCC-Clark, as it is much less crowded than the UBC B-line so I know that it would be a dud for a tramway. I am from Europe and even small towns like Bordeaux, my birthplace, use commuter trains to service trains in the region (there are 15 commuter train lines radiating from Bordeaux and 64 inter cities bus lines connecting 379 small towns away from these train lines that were built a long time ago). especially in big metro areas like the big Düsseldorf/ Cologne/ Bonn/ Wuppertal/ Essen/ Dortmund area (that includes a few other less well known cities). Metros (U-bahn in German), run mostly–as a general rule–within the main city of a metropolitan area. Just like in Paris (same size as the city of Vancouver but with 2.2 million people), there are numerous bus lines besides the 14 metro lines that only run within Paris–save for a couple that go just over the border with a suburb–and the 5 RER lines (express commuter trains running underground in Paris and used as Metro within Paris). In Europe and Japan Automated systems a bit like SkyTrain but with rubber tyres on their wheels and platform walls to separate platform from tracks, are used either in smaller metropolitan areas around a million—like Lille and Toulouse in France, where they are sorry they didn’t use bigger wider ALRT the size of metros–OR to link 2 districts of a town. In Kobe-Japan, for example, 2 AGT lines (as they call ALRT) link the mainland with artificial islands in the bay. Kobe also has 2 metro lines, numerous urban buses and the railway lines of 3 different private companies JR, Hankyu and Hanshin (the last 2 are now owned by a single company but they have kept their name, image, traditions, colours etc.). In Tokyo one AGT goes from a station on the Yamanote, a railway line that loop around the major wards of Tokyo to Odaiba, an artificial island. Another AGT line starts at another station on the Yamanote line and connect with other rail lines and a cute tram system that uses small single cars. ….even small towns like Bordeaux, my birthplace, use commuter trains to service trains in the region (there are 15 commuter train lines…OOPS! where is the edit button??? Red Frog, I don’t know the route up to Arbutus would be a dud as a tram/LRT line. I think it would be successful. The problem is in Metro Vancouver we have such a backlog of very important transit needs that it will be a long time before it becomes the most important/best cost/benefit project. Clearly rapid transit on Broadway would have a better cost/benefit even at a higher cost. The big problem I see with this is if it goes forward it becomes the excuse to not do anything on Broadway where the real problem (or benefit) is. I have often thought the old Marpole-New Westminster interurban line would be a great LRT route. There is now plenty of residential density in the high-rises and townhouses south of Marine Drive in Vancouver. There will be even more as the huge residential development on the old White Pine lumber site in the southeastern corner of Vancouver is finished. The current 100 bus route that somewhat follows the Marpole-New Westminster line is not a great option for anyone living in those residential areas. It requires you to cross a very busy Marine Drive in the east side with few convenient pedestrian crossings to catch a westbound bus. The existing CP track (and former BC Electric Railway route) however, goes right through most of the developments. There is room for double-tracking and only a short local CP freight uses the line. That train could easily be accommodated in the overnight hours. The route also connects several major shopping destinations including the Great Canadian Superstore in Vancouver and the large Marine Crossing mall complex in Burnaby at Byrne. A large office park in Burnaby south of Marine Way would then also become easily accessible using a rush hour shuttle bus to serve the area. The route would be a shortcut between the SkyTrain stations along Columbia in New Westminster and the airport with a connection to the Canada Line Marine Drive station at Cambie. The line would be a feeder to the Canada Line. The LRT could later be extended north along the old Arbutus right-of-way if the Canada Line becomes overcrowded. Another possibility could be an extension to UBC entering at the southeastern part of the campus. While not thought of as a major transit corridor today, it could easily become one again if rail transit is reinstated decades after the last interurban cars ran on the route in 1956. As a regular user of both the 99B line and the 84 express line to VCC/Clark, it is obvious that a rapid transit route has to be on Broadway then 10th avenue. Light rail means that both the vehicles and the tunnels are smaller than those used in conventional subways (London, Paris, Berlin Toronto, Montreal and many more). To increase the number of passengers per hr. one can increase the number of cars per trains and the frequency of trains per hour. I think that having trains only 1 minute apart is the maximum possible. One can also have more passenger per train..this means longer and wider trains, as in the heavy duty conventional subways systems. SkyTrain various train sets aren’t any bigger, nor carry more passengers, than LRT (still called tramways in Europe). Some of the biggest, currently used, LRT /trams go from a Siemens 2 cars set (58 metres long, 344 passengers) to a Flexity Swift 2 cars pair (84 meters long, 400 passengers) and a Citadis 2 cars pair (also 84 meters long, 600 passengers). By the way the Seattle LRT ( 2 cars, 400 people) runs in a wide tunnel downtown, shared with buses, then in a dedicated fenced-in right-away by the stadiums, on a short viaduct , on a long section at street level and finally a viaduct in Tukwila. In that last section it looks very much like SkyTrain. SkyTrain various trains go from the Canada line (2 mated cars, 42 metres long total, 334 passengers), to the old Mark I with 6 cars (72 meters, 480 passengers) and to the Mark II, with 2 pairs of mated cars (68 meters long, 580 passengers). By comparison, London Tube S8 trains are 134 meters long, 8 cars, just over 1000 passengers, and Toronto latest subway trains are 139 meters long, 6 permanently mated cars, 1100 passengers. Older subways, including Toronto, were built in days when the number of expected passengers was much less than it is now, yet they still can accommodate more passengers. A SkyTrain size subway may well suffer within 10 years the fate of the Canada Line that is already overcrowded and has underground stations that are much too small for longer trains. Another big problem is that there isn’t in Metro Vancouver several commuter train lines coming from all directions, with trains running all day long, and servicing both far-away communities and the suburbs, as those found not only in towns with a metro population 2.5 million and up, but also in towns with a metropolitan population half that size! Bordeaux, for example, has 15 commute trains lines…and 64 commuter bus lines. >>Another big problem is that there isn’t in Metro Vancouver several commuter train lines coming from all directions, with trains running all day long, and servicing both far-away communities and the suburbs, as those found not only in towns with a metro population 2.5 million and up, but also in towns with a metropolitan population half that size! I would hope that the decision makers, planners, architects and engineers utilize the well-documented Canada Line experience (higher than expected demand = good; inadequately sized stations = bad) to build a better subway on Broadway. Warts and all, I believe the Canada Line is a success story if only because it opened people’s minds to building a decent metro system in the inner city. It is vital to get Broadway right because of the huge potential ridership from day one. Unlike the Cambie corridor, Richmond, Surrey and any other urban area outside of downtown, the Broadway corridor has already been built up for a half century with the complication that the small city at the end of the corridor (UBC) forms its own additional demands. In my opinion, its 3+ billion dollar cost was justified 40 years ago. If done right, a Broadway metro will no doubt provide excellent value, top drawer transit service, and a cost per rider lower than Fitch’s and Condon’s Mickey Mouse attempts at transit planning that seems to lack …. well, adequate transit planning, let alone an understanding of engineering, professional level cost analysis, and proof that they have actually built stuff of consequence. I agree that commuter rail is a vital consideration as well, but you are also forgetting about rail / transit-linked passenger ferries to Vancouver Island and the Sunshine Coast. The price of fossil fuels may have to approach $3 a litre with all the attendant economic consequences before the message is hammered home to decision makers who seem too perpetually stuck in the last century to realize that we have to do it differently now. I just hope the provincial debt from building up to $15 billion in freeways (including debt servicing costs) doesn’t bankrupt the government beforehand. Our light rail absolutist from Delta commented again in Monday’s Sun about the proposed Broadway subway. The link and full text are below, and that’s followed by my longer response (for the benefit of Rees readers). A shorter 200-word version was emailed to Sun Letters, but I don’t know if it will be published. Broadway buses carry far too few people to justify a subway. Subways are not only expensive to build, they are notoriously expensive to maintain. Subways consume more power operating lighting, ventilation, escalators and elevators than operating the trains themselves; definitely not green when compared to light rail. Subways are notoriously poor in attracting ridership, as forced transfers and the long distance between stations makes them customer unfriendly. Journey times seven kilometres or less are slower taking a subway than using surface transit. Since 1994, the auto mode share in Metro Vancouver has remained static at 57 per cent, despite over $9 billion invested in SkyTrain. Building a subway would only drive up the cost of transit without reducing congestion. Metro Vancouver has a much higher cost per revenue passenger than Calgary, Edmonton and Toronto; building a new subway will only drive up transit costs and subsidies. There is no case for a SkyTrain subway on Broadway; in fact there is barely the traffic flow to justify an at-grade light rail line. It is time for Victoria to say no to a Broadway subway and invest in more affordable and proven transit projects that will reduce congestion and gridlock. 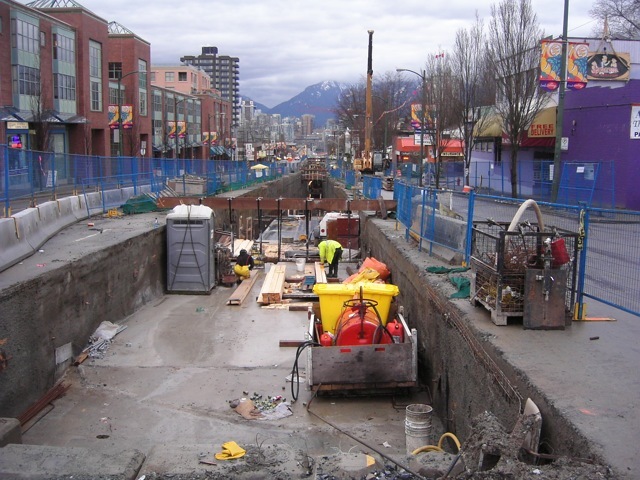 A Broadway subway will be the final financial straw that will break TransLink’s fiscal back. It is evident from his letter that Malcolm Johnston knows little about cities and transit planning (Subway unaffordable, Letters, May 12). The Broadway corridor and UBC have had the highest employment and residential densities outside of downtown Vancouver for decades. A recent KPMG report expounded on the corridor’s potential for high economic growth in future, notably in health sciences and expanded educational institutions in three locations. It is well-known how poorly this dense, active corridor has been historically served by transit despite one of the highest demand levels in North America. Johnston cites one piece of evidence to justify his strident anti-subway stance: a steady 57 percent automobile mode share since 1994. No surprise, he blames the devil incarnate (SkyTrain) for not bringing it lower, as though trams stuck in traffic on a milk run will. Most people can see that SkyTrain along with buses, ferries and commuter rail miraculously kept the auto mode share down despite the explosive growth in automobile infrastructure, population and cars during the same period. Johnston laughably determines the cost of electricity for light bulbs and escalators makes SkyTrain’s operating budget “notoriously expensive” while ignoring unionized train drivers on every LRT system. Driverless systems have far lower operating costs for obvious reasons. North American cities with surface light rail often can’t achieve the 75-second (or less) train frequencies per line that SkyTrain regularly sees every rush hour because of said higher labour costs and the safety risks at level crossings which negatively affect scheduling. Their solution is often identical to SkyTrain: separate the gradients, similar to the new western Signal Hill leg of Calgary’s C-Train system. All things considered, implementing decent transit is so much more than beancounting. Ignorance of the engineering, construction, spatial and safety parameters necessary to build surface light rail in the inner city — too many to list here – plays a significant role in the anti-Broadway subway meme. I suggest the last thing we need on Broadway is anything less than a seamless, high quality, safe, fast and frequent transit service incrementally planned for the 400,000 daily riders of tomorrow. Moving it underground will leave the street with ample room to vastly expand its pedestrian realm, improve the complementary Number 9 neighbourhood-level electric trolley service, and enhance the human-scaled storefront experience and thus elevate the quality of life where it really counts: on the street. Building transit in our cities under a national initiative could be a decade-long project with profound economic and ecological benefits, but it would take an enlightened federal government to see it that way. Therein rests the challenge. Meanwhile, if allowed to, light rail will have its place in Metro Vancouver, and indeed all modes of transit (most notably the lowly bus) are important and should receive decent, stable and long-term funding. But Broadway is 40 years overdue for a high-capacity subway that will become one of the two most important legs of the regional rapid transit network, and could make the M-Line the longest, most heavily rided and most important rapid transit line in Western North America. Using transit to divide, as Johnston does, rather than to unite city and suburb and garner regional support for all transit modes including light rail, subways, commuter rail, buses and ferries, bikes and Reeboks will only further the tendency of the provincial government to continue adhering to the last century when deeply-addictive car dependency was given the lion’s share of transport funding and a referendum-free, highly subsidized ride. New Westminster’s Keith Ross believes that UBC should fund a major part of the proposed Broadway subway (Letters, May 14), just as YVR imposes a fare surcharge to cover new transit demand on a separate branch of the Canada Line. Over half of Broadway transit users originate from outside of Vancouver’s borders, thousands from New Westminster. Over half again destinate to central Broadway. UBC has exerted a large transit demand in this corridor for many decades, but not the majority. Ross’ user-pay philosophy has merit, but unlike most roads transit users already pay a toll every time they buy a ticket. Broadway’s huge transit demand is historic and is capable of showing a profit in the long-term, provided SkyTrain’s unique high frequencies are utilized. In fairness, Ross should have recommended cities outside of Vancouver and the health sciences institutions, commercial-retail and private offices in the Broadway corridor provide a billion to help fund a subway. Like that will go down well. Remember that Broadway will be the third and most important segment of the Millennium Line that will ultimately join four cities (including New Westminster) and achieve one of the top ridership levels in North America … if it’s ever built. I think it reasonable that UBC contribute to the capital cost of the line (at least for its stations(s) – as YVR did ($300 million), amd Morguard (Coquitlam Centre’s owner) is doing for Lincoln Station, and various developers are doing for Capstan Station. I don’t think there should be a surcharge. Also note that the YVR branch surcharge does not go to YVR (and does not recoup capital costs), it goes to TranslInk to fund the operation of the YVR branch at the level of service required by YVR. One other consideration not generally mentioned regarding UBC ridership – many passengers on the UBC will be students using U-Passes (provided at discount rates) – so their revenue share will be lower than full paying passengers (i.e. central Broadway passengers). The trains may be full, but the accounting needs to be tweaked. WRT businesses and landowners paying for the costs of rapid transit – I would think that such infrastructure costs would be paid for through taxes (at all levels of government, whether on income or property). I got very curious about my assumption that underground utilities (amongst other things) would greatly impact the ability to build light rail on West 16th Ave, so I went on Van Map and activated all the utility layers I could find to apply them to Adam Fitch’s proposed tram route. This was a very educational exercise, not unlike some projects I’ve been involved with where the base information changes the design scope, often dramatically. I mapped them in several locations but unfortunately am not able to download the graphics to this comment thread. There is a thick array of major utilities running on West 16th Ave for its entire length to UBC, but notably an absolute mess concentrated at Blenheim eastward to Arbutus, and from Dunbar west to Crown. The utilities in the blocks near Blenheim occupy space under every traffic lane and in several places under the median (centre + both edges). They are major regional trunk mains, not just small laterals servicing houses, and include an 80 cm Metro high pressure water trunk main, a 1 m Metro sanitary sewer trunk main, a 30 cm Vancouver high pressure water main, two 30 cm combined sewer mains (storm and sanitary), several smaller laterals, a major gas main (not shown on Van Map) and probably one or two communications conduits. Relocating gravity-driven utilities like sewers affects not just the mains within the immediate construction zone, but perhaps 50 m on either side as you change their invert elevations and slope, therein their ability to drain. This means that the utility relocation disruption (and additional costs) must extend up the side streets where lateral lines extend from main lines. The array is so dense in this two-block section (~440 m + ~300 m total on six side streets) that it would be impossible to build track beds of any kind there without ripping out and relocating at least three of these deeply-buried services at about $2,500 a linear metre per utility, two trenches per utility (existing location + new location), rebuilding the side street laterals, then adding road rebuilding to the cost. Including side street excavation (see last paragraph), there’s over eight million bucks right there in additional costs before the tracks have even been lain (or $18+ million per km). And probably another $6 million in the Dunbar – Crown section where major water mains and valve arrays are located. Not all parts of 16th Ave have the same dense clusters of underground utilities, but every metre of that road does have major services. In the Cheap But You Get What You Pay For option, a tram line could weave from one side of the road to the other side to avoid the utilities, especially the large regional high pressure water lines from the UBC reservoir. But that’s a lot confusing snaky kinks in the line, which would result in snaky and unsafe kinks in the road lanes. Then there are the large trees removed from the median where the line by necessity must travel in sections in this scenario. At least three complex utility arrays occur over at least six or eight blocks that must be relocated for an additional cost of around $20 million in any scenario, or the line will not get built. Sucking up the cost of relocating utilities over the 4.5 km Arbutus – Blanca section of 16th Ave would result in an additional cost of $35-50 million. Buying up half-blocks of houses to avoid the concentrated arrays of utilities over three, two-block sections would cost at least $75 million in addition to the utility relocation costs ($15-30 million) outside of these areas. But oh yes, this tram line would still be a “bargain” compared to a subway on Broadway. Well, that’s not a comment that can be applied to Adam Fitch’s route because it avoids the transit demand of Broadway altogether, which just happens to exceed the demand for UBC. I don’t know why tram aficionados are incapable of conducting research to back their ideas. A cursory Internet search would have turned up examples from all over the world where surface rail transit costs escalated with the relocation of underground utilities. Edinburgh council had to absorb a 200 million pound Stirling cost overrun and years of delays for this very reason. I am quite disappointed too because I was hoping light rail could prove its worth in Vancouver, but not on Broadway where a subway is justified, or on routes with already decent trolley bus service. West 16th-Arbutus-King Edward-Kingsway-Nanaimo-22nd Ave—BCIT-Canada Way to New Westminster was such a route, but dealing with major utilities could potentially add a billion to the cost. Now I am looking at next generation BRT alternatives where even triple articulated trolleys can be easily detoured around utility construction or repair sites. Welcome to the real world, Adam. One of the biggest costs of at-grade LRT railbed construction is the relocation of utilities so the trains won’t have to be stopped in future if repairs are needed. The Canada Line contractors avoided the big BC Hydro conduit under the Cambie median by locating the tunnel under the northbound roadway. Competing bidders missed that cost-savings option. The Metro Vnacouver trunk sewer under 8th Ave. rules out 8th Ave. as a Broadway Line route and there are many utilties under Broadway itself, so the favoured route for the tunnel has always been under 10th Ave. Guest, I am aware of the 10th Ave route issue. I lived on 10th for five years and I think the residents (not to mention VGH and businesses on 10th) will do everything in their power to cancel any tunnel construction there, most especially the discredited cut-and-cover method. There are a number of older masonry buildings with zero clearance to the 10th Ave lot line parallel to Central Broadway. Moreover, the road is only 20 m wide, whereas Broadway is 27 m at its narrowest point. This means the sides of the excavation would literally go under occupied buildings. Even bored tunneling under 10th could undermine existing building foundations unless they went deep. Granville St at 25 m had wall-to-wall excavation pits for stations, and the outside bored tunnel walls were only a metre or so less apart. A 10th Ave tunnel also presents grade challenges to access platforms in both directions, even with a double-deck design. A subway has its critics and one of their pet arguments is that the platforms are a substantial distance below the stations. I don’t put a lot of credence in that, but they may have a point if platforms were placed 100 m away under 10th. In my opinion, bored tunneling with steel-covered station excavations directly under Broadway is the only construction option that should be considered after the Canada Line fiasco. Expensive? Yes. But the debt amortization will end only 1/5 of the way through the subway’s design lifespan, if that. Beyond debt paydown, it’s very high ridership, exceedingly low per capita operating costs, and a profitable and very efficient piece of transit for a century or more. We’re supposed to be building cities with greater resilience to meet the challenges ahead. This is one of the important elements that will help achieve that, especially considering its potential high-quality rapid transit connectivity to the rest of the region. I could see a stacked tunnel under 10th Ave., which would also facilitiate escalator/elevator-free access using ramps to at least one platform. Stations could be loaded on the north side only. King Edward Station, Granville Station and Burrrad Station might provide some guidance as to tunnel and platform width – each of these stations has platforms on only one side with the main access to the platform through an adjacent parcel of land (not necessarily within the right-of-way). 10th Ave. is not a major thoroughfare, nor a major retail strip like Broadway, so road closures would have less impact than Broadway itself (or Cambie). 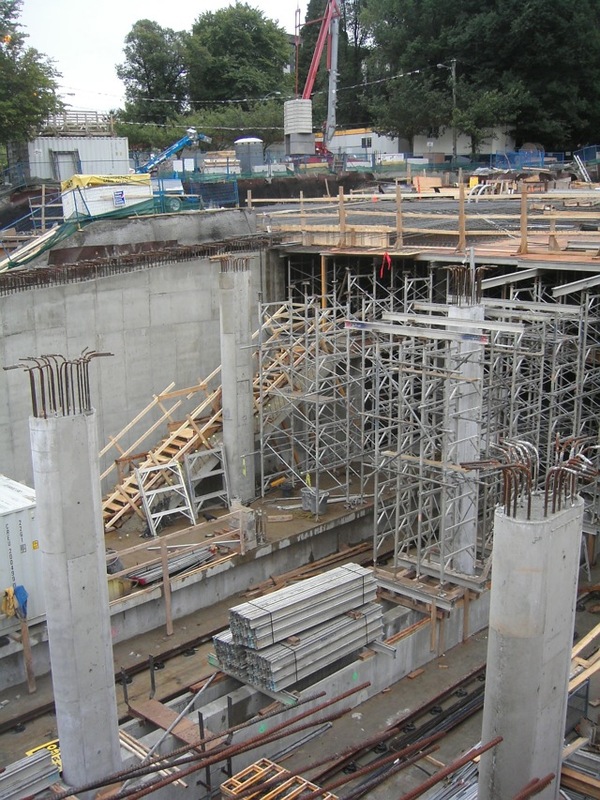 Construction near the emergency entrance at VGH could be staged to minimize disruption and maintain 24hr access. Stations under Broadway (even if the tunnel were bored) would still likely be built using an open pit method, which would still cause jams on Broadway. WRT walking the distance to 10th Ave from Broadway, the ramp entrance at the existing Broadway-City Hall Station is just shy of that distance. In the pic below, you can see the platform stairs, and the trailer with the yellow stripe is on 10th Ave.
Also, by comparison, the Bloor Danforth Line in Toronto is just to the north of Bloor Street, not under it, and most main station entrances are off the side street – entrances to the Broadway Line stations could be off the main cross streets, rather than Broadway itself. That may also provide easier access to north-south bus routes. Guest, if given the choice between only two options, a subway tunnel under 10th Ave (double decker or not) or no subway, I’d take 10th, of course. However, I feel that if a decision is made to spend billions on a subway, then it should be done right from a design perspective. By “right” I mean designed for 150 years of service. That includes having more than one station entry, maximizing the platform width and length for future use, and minimizing the passenger’s travelling distances and construction disruption as much as humanly possible. Remember, a subway is a pedestrian realm more than anything else. It should also have the highest quality architectural and engineering standards. And the cost evaluations must, in every case, account for per passenger costs over the life of the asset, the most resilient effects on city building, risk management, energy conservation* and environmental impact. You have at least 80.4m to cover between the parallel Broadway Ave and 10th Ave road allowances. Should the tunnel be built on 10th, a passage through two adjacent properties is necessary. Because of existing grades, the station would be at grade on the south side of Broadway, but must descend under the lane behind within a 35m distance, then proceed into the basement of the second property to the south before entering the subway platform box. That’s at least two private properties to punch through horizontally for each station access. It stands to reason that the transit authority will want to minimize the width of the entries and provide only one per station in order to avoid expropriation of private property and property value diminishment claims issues, even if the platforms are 100+m long. You’ll always have excessive crowding in the one common entry and egress point, a la the Canada Line. Fire escapes will still have to be provided on 10th in at least two places per station (and vents at both ends where train noise is clearly heard), so there will be fairly significant above ground structures present on a residential or heavily used institutional street. With the platforms directly below Broadway, station entries can be placed on both sides of the road, either in the road allowance (in a widened sidewalk or parking lane) or within a minimum number of adjacent properties. It would be very easy to negotiate with a developer to incorporate a station entry in their development on Broadway, but almost impossible on 10th where older residences abound. In some cases (e.g. Broadway x Cambie) entries could be placed on all four corners, therein making it safe and convenient for pedestrians to transfer to buses without having to cross the road. There are also some very conveniently located vacant lots, gas stations or relatively easy to redevelop properties on Broadway at most of the proposed station locations. They include several properties owned by the CoV on the south side of Broadway immediately east of the Broadway-City Hall Station. I have no doubt that the City would allow TransLink to demolish the entire block east of the existing station, recycle to materials and excavate to the subbasement level. This will allow a station box under Broadway to be excavated from the side rather than from above (and supply several additional points beyond one tunnel portal where boring spoils can be lifted to trucks on the surface) with a caisson-supported temporary steel plate cover placed over top to accommodate four lanes of traffic. Moreover, some of the utility equipment (electrical rooms, pumps, conduit chases, etc.) can be placed in the subbasement next door, thus freeing up more room on the platform. I envision stations having a vertical profile with two levels. A passenger will descend from the surface at either side of the street to a very wide mezzanine about 9m below the sidewalk, with a ceiling about 5m above the floor and just below the street utilities. The mezzanine will be no less than 20m wide and will extend the entire width of the station box with stair / elevator / escalator access to both sides of the street. The centre-loading platform placed between the tracks below will be accessed from both sides of the mezzanine (i.e. from two directions) with multiple escalators and elevators and be placed just low enough to provide adequate train height clearances. The entries above the mezzanine will be designed to allow maximum natural light penetration as deeply into the station box as possible. The mezzanine will be wide enough for not just the ticket hall but open newsstands, coffee outlets, small stores, washrooms, etc. The advantage of this design and methodology is that once a station is completed, the adjacent construction access lot can be sold quickly in an attractive pre-excavated and pre-shored state to a private developer to build a 100% transit-oriented project (with construction-related savings discounts on units with no associated parking) or, in the case of the 400 block Broadway (south side), returned to the City and developed at a discount immediately after with a new seismically stable and highly energy efficient city hall. Everything that you mention makes sense – but the driving factor, I think, will be the cost. The stations you describe seem to be much like the ones proposed for the Eglinton Crosstown (or even the Spadina extension) in Toronto, and it would be very nice if most stations had mezzanines (i.e. think Oakridge and 49th Ave., which instead have cheaper underpasses (like the original cut and cover segments of the Yonge Line in Toronto (i.e. Queen Station, Dundas Station)). Note that double bore tunnels could provide center platforms (like Canada Line downtown), but a single bore tunnel (like the Evergreen Line tunnel, which has no stations), would suggest side platforms. Potentially, a single bore tunnel could also house stacked guideways, rather than side-by-side, plus part of the platform width within the tube. I suspect that if Broadway is going to be bored, the experience gained locally with the single bore on Evergreen may lean towards that method. Mezzanine stations can still be built with side platforms (configured like Broadway-City Hall). I think you’d have similar issues wrt venting and emergency exits on either 10th or Broadway. Arguably, with greater pedestrian volumes, an emergency exit “pavillion” would be more of an impediment to pedestrian traffic on the Broadway sidewalk than on 10th (think of the exit at Granville & Robson). Even redevelopment of adjacent sites does not guarantee venting or exits that are integrated with new development – at Bentall V the parties could not agree on how to move the sidewalk grate vents to the side of the new building – so they remain in the sidewalk (even though it was originally intended that they be shifted when redevelopment of the former YWCA occurred). Larger stations may be appropriate for central Broadway, but they can be smaller (in terms of entrances and circulation spaces) west of Arbutus (other than the terminus at UBC). I also think the line can be phased, initially stopping at Arbutus (noting that the B-Line from Broadway-Commercial Station carries both central Broadway & UBC passengers, so UBC passengers alone shouldn’t initially overload a shortened B-Line). In terms of street access, it is, of course, cheaper to build, equip, maintain and monitor just one entrance, but I think the City also wants to encourage pedestrian use of the sidewalks rather than underground (this could also be related to safety issues at off hours). And of course, in respect of cost, there’s always the push / pull between the Broadway Line and rapid transit expansion in Surrey. I look at Toronto and their “grandiose” stations on the Spadina extension (large underground station in the outskirts and underground alligment through empty fields (i.e. they are tunnelling under Hwy 407) on the one hand, and the lack of expansion generally, on the other, and can’t help but think that they aren’t spending their money wisely. Metro Vancouver has done well, for a region its size. Wrt street access, another example would be the passage under Beatty St. at Stadium Station which was built to connect to future development to the west, but when the Simons / AMEC Building was built, it wasn’t connected to the passage. The stairs were evenutally filled with sand (in part due to safety concerns) and part of the passage houses (or used to house) the lost articles office. Underground stations nowadays seem to be built with knock-out panels for “future entrances” (i.e. at the end of the mezzanine at Broadway City Hall facing west (eventually to link to space at CrossRoads temporarily housing retail) and in the ticket hall of Oakridge Station facing north), with developers to pay the cost of direct access through their projects. One problem, it seems, is that most projects in Vancouver aren’t large enough to carry the burden of the cost of a separate underground passage. Pacific Centre and Vancouver Centre both connected to Vancouver City Centre Station (literally abutting the station, so low construction costs?) – but that made sense as they want retail shopper traffic. The Park Place office tower (one of the biggest in the City, but with minimal retail in its basement) was originally intended to connect to Burrard Station (as Royal Centre and Bentall Centre (which both have larger shopping concourses) did) but a connection was never built. Hopefully the redevelopment of the Bay Parkade will directly connect to Granville Sttaion – as the ticketing hall for that station is directly under Seymour St. (mid-block)and abutts the site. I agree that a single bore tunnel with a larger diameter to carry two trains would work, and the stations could have side-loading platforms and a mezzanine connecting them from above. A single bore would potentially result in some savings (unless TBMs are refurbished for another Canadian project and therein the costs are shared), but I don’t agree that a phased project would. Two tenders, two contractors, two management bureaucracies, two consultant groups, two financing efforts and often changing political priorities always adds up to more cost in the end, not to mention the risk that delays could be extended forever and the last phase dropped. Contractors often sweeten their bid with lower unit prices or generous community benefits on larger projects. The above points are why I believe the federal government must be actively involved. Who else can negotiate the deepest discounts with the private sector on transit projects that are part of a national transit program? It has happened in Lyon, France before: A subway extension (Line B) to the Lyon university never happened, it has been replaced by a LRT (T1), and everyone seems pretty OK with that. I’m with Voony regarding phasing the line. First phase would see a tunnel as far west as Arbutus (only because it would cause far less disruption than terminating at Granville). The B-line would then operate from UBC to the existing trolley loop around the VSB building at 10th and Fir. There is simply nowhere to turn 20 articulated buses/hour near Broadway and Arbutus. This would greatly reduce the cost of improving transit on Broadway making it a far easier sell to suburban referendum voters who think Vancouver already has an unfair amount of rail transit. It would also reflect the reality that peak-hour, peak-direction travel to and from UBC is probably never going to increase. Full time student numbers have been static for decades while UBC has been building thousands of housing units for students, staff and the general public within walking distance of campus. Even if massive developments are approved for the proposed west Broadway and 10th station areas there would still be little need for any transit expansion. The fleet of buses serving UBC run mostly or completely empty in the opposite direction. Phasing the Broadway subway has a certain logic in the context of today’s transit budgets that originate from either the amputation theatre or the morgue, and also in light of the rather unfair referendum that bullies the kid sister while the fat brother gloats on the sidelines. But when considering 21st Century urbanism and the fact cities are indeed the economic engines and heart of culture, outperforming even our energy resources by orders of magnitude, stopping short on Broadway is like cutting and running well into your journey because you “can’t afford” to arrive at the destination. Metro Vancouver occupies less than 1/3 of one percent of the land in the province yet produces half its GDP. I simply don’t buy that a $3 billion subway is unaffordable with a one-time capital cost at slightly more than 1% of the Metro’s annual GDP. Every marketplace and institution, and the decisions made within them, take place in cities. People at the top of the decision-making chain need to come to terms with the fact that even with their concentrated economic performance, cities remain terribly inefficient and susceptible to maladies on several fronts, not the least fossil fuel depletion. What I am saying is that the big picture of a national transit plan (let alone a transit plan – any plan – by the BC government for the largest city in the province) should not be sacrificed for the expediency of today’s conservatism and in line with pre-existing premier-mayor rivalries. We do have the funding because we are a very wealthy society, but have elected governments that have chosen to invest in vast urban infrastructure with unhealthy dependencies on forces not within our control, governments that maintain distinctly last-century views. It bears repeating, the Broadway corridor to UBC happens to have the second and third largest employment centres and public transit destinations in BC, the most heavily travelled bus corridor in North America, and enough complementary residential density to support a subway with the highest order of service, in my view. This corridor and Vancouver will never be less dense than today. We have the Jericho Lands coming on stream in a decade that will put pressure on both Point Grey and Broadway. The UBC stats on students may be stable for now (I doubt that has been so “for decades” — that needs a citation), but that doesn’t mean it will be so for decades to come, or change its four-decade old status as one messy hub of transit passenger congestion. And to suggest the B-Line runs empty back into town — that is certainly the opposite of my observations during working / session days well into the evenings from many parts of Broadway and West 10th, and even my experience back in the 80s. The B-Line is terribly inadequate. You do not reduce costs by phasing single large projects. That is a false economy. The unit costs over time always increase, and the cost to the public is higher when the second phase is completed than if it was done under one contract. Phase One will always be less than Phase One + Phase Two, but the unit costs are never lower. A contractor must win several projects in several tenders released together to affect significant discounts on unit costs, or the federal government must guaranty lower costs in equipment, materials and consultancies under very large procurement contracts for several projects in several cities under one program. Purchasing 500 train cars in one contract distributed to ten projects in several cities will always be a lot cheaper than purchasing 40 cars for one project. I ran some preliminary numbers and found there are indeed some savings using a single large diameter tunnel rather than smaller twin tunnels. Assuming a 30 cm concrete tunnel liner, you save about 1.6 m3 of concrete per linear metre with a 10m diameter tunnel compared to twin 6m tunnels. That works out to 9,600 m3 of concrete saved in the 6 km between Main and Arbutus, 12,800 m3 saved over 8 km to Alma, or 19,200 m3 over the 12 km to UBC. Ready mix often rings in at ~$330 / m3 retail, but the tunnel liners will be cast in a plant with its own on-site concrete batch plant, so the cost will probably be about $150 / m3, bringing the savings to between $1.4 and $2.9 million, depending on how far they take the tunnel. The cost savings should be about 25% more per linear metre because of the rebar and special steel forms. The savings are not a huge amount, but they’re nothing to dismiss either. Regarding design, I will always defend providing large stations that possess beautiful architecture and are accessed from at least two sides of the street, and the enhancement of the pedestrian experience at street level. These are investments that must be made in my opinion if we are to attract enough people from all walks of life to make the transition to a resilient and sustainable city life. Striving to be above the utilitarian in our Western Canadian cities, cities built primarily on mediocrity, is a noble 21st Century goal. Moreover, a Broadway subway should never be built for today. It must be built for tomorrow, and considering the challenges ahead, tomorrow will look a lot different than today. Energy efficient and highly-humanized cities are where we are heading whether Christy Clark’s bridges and highways and subsidized fossil resources lead us into a debt-saturated reality or not. Purchasing 500 train cars in one contract distributed to ten projects in several cities will always be a lot cheaper per unit than purchasing 40 cars for one project. This implies that transit will not need improvement to UBC for the foreseeable future, which of course I think is horse feathers. Even though UBC students account for just 38 per cent of trips in the UBC-Broadway corridor, transit use at UBC has increased by 294 per cent over the last 15 years. In 1997, 77 per cent of commuters arrived at UBC in a car, while only 18 per cent took transit to the Point Grey campus. Last year, however, 54 per cent of commuters took a bus to UBC, while only 35 per cent arrived on campus in a car. To put these figures in context, three years ago, the website thetransportpolitic.com conducted a survey of modal split in major North American cities and found that in New York City 54.9 per cent of commuters took transit to work each morning. That’s an increase of nearly 300% in 14 years. Pretty damned impressive if you ask me, especially because it stemmed mainly from a policy shift to U-Pass, not from an infrastructure project. That’s also before any major increase in service quality represented by a subway, let alone the Network Effect that a direct link to a quality, highly interconnected regional rapid transit system would bring in the form of a much more dynamic transit mode share.